Many of you have probably been using Windows 7 for quite a while now. It’s really quite a solid operating system, with stability and functionality far exceeding anything Microsoft has offered before. You may, however, be unaware of one of the great productivity advantages that Windows offers you. That is keyboard integration, which is far more advanced than other platforms like Mac OSX. Windows is entirely functional without a mouse cursor, and indeed many features can be accessed much faster through the use of keyboard shortcuts. Hopefully the shortcuts below will be of use to some of you. I know I learnt a few new ones when researching this article! With stricter security under Windows 7 comes the need to occasionally open programs as the Administrator user. Usually you need to right-click and then select “Run as Administrator”, but with this short-cut, you can avoid that step. This is very useful if you like using the command prompt. If you shift+right-click on a folder, a new option will appear to “Open command window here”. Clicking on that will open a command prompt at that location. Pressing the windows-button and a number from 0-9 will select an item on the taskbar (0 is equivalent to 10). Potentially a fast way of switching between applications that you are using for keyboard input. For example, you could use it to switch focus between two open documents. 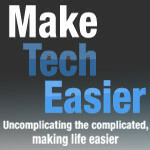 maketecheasier.com keyboard shortcuts, maketecheasier.com, Microsoft Windows 7, Windows 7. permalink. How come when I send the url listed above to a friend and a few days later its gone?…. This is great, I did not know about this feature.